In the wake of the Christchurch mosque shootings, the country has been forced to endure the Great New Zealand Chimpout. This has involved everyone losing their minds, and over-reacting in ways that they may later come to regret. One of these over-reactions was to ban Branton Tarrant’s Great Replacement Manifesto, an action which was – as this article will show – a violation of the basic rights of New Zealanders. 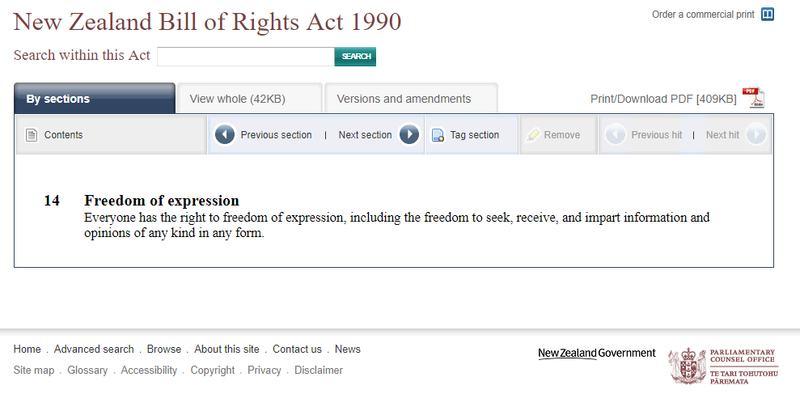 The idea of the New Zealand Bill of Rights Act is ostensibly to “affirm, protect and promote human rights and fundamental freedoms in New Zealand”. Supposedly based on the American model of inherent human rights, the NZ Bill of Rights Act is said to guarantee the rights of Kiwis and delineate areas in which the Government cannot take freedoms away. This states, perfectly clearly, that New Zealanders have the right to seek the Great Replacement Manifesto, to receive the Great Replacement Manifesto, and to impart (share) the Great Replacement Manifesto. Consequently, the actions of the New Zealand Government to ban this document are illegal, and are a violation of the human rights of New Zealanders. The Government doesn’t want anyone becoming aware of its failures. Like the psychopathic narcissists they are, politicians are incapable of admitting that they are ever wrong. Therefore, they are incapable of admitting what every working-class Kiwi already knows: that mass immigration has greatly enriched the already wealthy, at the expense of the already poor. What they really, really don’t want is other working-class people realising that the demographic trajectory of New Zealand appears to be taking them on a path towards Brazil, and then South Africa, and then Haiti. Because, if they do realise this, then the Government either has to take action to prevent it (which will put them offside with their masters in banking and industry), or risk more mass shootings as the position of the working class continues to decline. Much better to kick the can down the road, and just try not to talk about it, like we did with drug law reform, euthanasia law reform, climate change etc. Otherwise, someone has to point out that the emperor has no clothes. The fear that the charade might soon be over has led to a state of panic among New Zealand’s ruling class. This atmosphere of panic, coupled with the unusually large number of weaklings in the highest reaches of Government, is why there has been an over-reaction like this. Most New Zealanders are still running around like headless chickens, and in their submission have accepted that the Government can take away any rights it sees fit. Moreover, there’s a set precedent that the Government can violate the Bill of Rights Act and no-one cares. As a previous article here has pointed out, psychiatrists already violate the Bill of Rights Act by forcing medical treatment on people who have explicitly withdrawn their consent. This has even gone as far as electroshock treatment, but only alt-media sources like VJM Publishing are interested in taking up the issue. What needs to happen is twofold. The Government first needs to quietly make Tarrant’s manifesto legal for people to read. Second, it needs to address the concerns raised in the manifesto in a more honest and respectful manner than just screaming about “white supremacism”. After all, the bulk of the concerns about the effects of mass Third World immigration are held just as strongly by Maoris as by white people. If the indigenous people of New Zealand don’t want to be replaced by overseas sources of cheap labour, then this has to be acknowledged and addressed. If they believe that maintaining some level of ethnic homogeneity is better than full globohomo, then this has to be acknowledged and addressed. If they believe that the past conduct of certain ethnic and religious groups is so poor that we would be better off keeping those groups out of the country, this too needs to be acknowledged and addressed. An honest conversation with the New Zealand working class has been needed since the imposition of neoliberalism. True courage, and true leadership, would see it happen soon. The New Zealand Government has to speak honestly to the people about their vision for the nation. It cannot end suffering by banning information and sending the Police to harass any Kiwi who speaks freely. It doesn’t really come as any surprise that New Zealand’s upper political, academic and social echelon are just as blinded by their religion of diversity and absolute equality as the rest of the Western world. The ruling classes in NZ (and elsewhere) reacted exactly in the way which BT predicted they would – with more censorship and social estrangement.